It was a warm opening day 2017 in Livingston County. I didn't expect to see much, but I look forward to that day for three quarters of the year... so I had no choice but to go sit in my stand. I saw some big rubs while scouting in the preseason so I knew there was a good size buck in the area, but that has happened many times before and I only saw scrub bucks all season. So, I didn't get my hopes up or really expect much. I had been in my stand for about 45 minutes and was cursing a squirrel under my breath for forcing me to keep looking in its direction.... ya know, just in case. Well wouldn't you know it, for about five minutes, I boycotted looking at the squirrel, but when I finally gave in... my heart skipped a beat. About 20 yards to the side of me I could see this big ol' 11-point buck just moseying towards me. Since I boycotted looking at the squirrel for so long, I now had to get in position to shoot with this slob right there. By the time I got ready to shoot, the deer had come in to just under 10 yards, but facing away from me. I wait, and wait, and wait, trying not to fall out of my stand from shaking so much, when he starts to turn. I drew back, anticipating him to keep turning, but then he just stops! So here I am, arms quivering from being drawn back so long and my entire body shaking out of excitement, when he does one giant step, leaving him right in front of me broadside. I line up my shot, take a big ol' deep breath... then I let her rip. Here I am, mentally prepared to watch this guy for as long as I can to assist in the tracking process, but nothing happens!! He just stands there for what felt like ten minutes (4-5 seconds in reality). That was the longest 4-5 seconds of my life! In those short moments I managed to convince myself I had missed, even though I was staring at my fetching's sticking out of his chest. Just as I was about to either grab another arrow, or start screaming obscenities, doesn't he just tip over. Didn't stumble, didn't run, didn't even blink, he just fell over. Throughout all my 18 years hunting I have had an 8-point curse. No matter what was around I couldn't break that 8-point barrier. 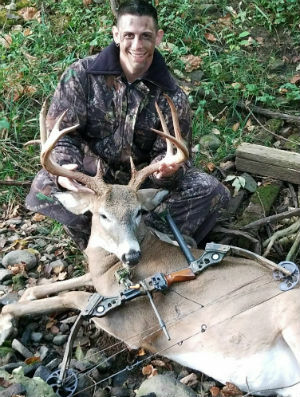 I managed to shoot a 130 class 8-point, but again, I was still within the curse. At the point this buck fell over I felt the need to cheer, but in the excitement of what had just happened, and my streak being broken, I'm pretty sure all that came out were some strange noises. The buck green scored 145 2/8. He is an 11-point and is my biggest and most point buck to date, and this was an experience I will never forget for the rest of my life!